OTH Magazine is back fresh off being named the "Magazine of The Year" at the 2016 Grind Face Awards. 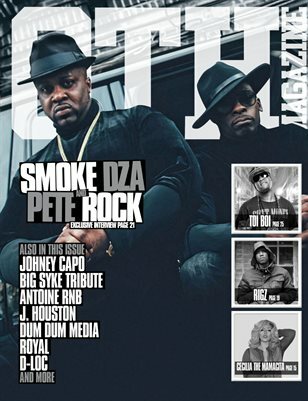 This issue we catch up with "The Kush God" Smoke DZA and the legend Pete Rock to discuss their instant classic "Dont Smoke Rock" and travel to Thailand with us as we interview some of their most prominent hustlers. In the "Thailand Takeover" we talk to club owners, models, promoters and more and get an understanding of the Nightlife overseas. Other interviews this issue include, Rigz of DaCloth, Cecilia The Mamacita (93.5fm KDay), General GC, Amtoine rnb, J Houston and others, as well as a tribute to the legendary Big Syke. For placement or any questions contact overtimehustlin.com!